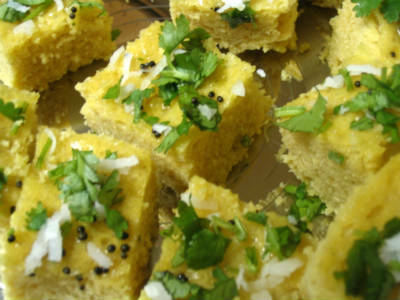 Dhokla is a popular fast food from Gujarat. This is a variation of the regular dhoklas. 1. Mix gram flour, salt, lemon juice and 2 cups of water in a bowl. 2. Mix well without any lumps. 3. Add little warm water to cooking soda and add to the pan. 5. Pour the batter into greased idli moulds (or a plate) and steam cook until done. 6. Cut into pieces if desired and keep aside to cool. 7. Dissolve sugar in little water and sprinkle over the dhoklas. 9. Fry the mustard seeds, green chillies, coconut and coriander leaves for 30 to 45 seconds. 10. Pour over the dhoklas. Feel free to comment or share your thoughts on this Hot and Sweet Dhokla Recipe from Awesome Cuisine.